No Discharge Areas | Welcome to NJBoating.org! The Barnegat Bay, Manasquan, Navesink, Shark, and Shrewsbury Rivers are designated by the New Jersey Department of Environmental Protection and the United States Environmental Protection Agency as No Discharge Zones for boat sewage. What does it mean to be a No Discharge Zone? It means the discharge of any boat sewage, treated or untreated, is forbidden in these areas. These waterways have sufficient boat sewage pumpout facilities to accommodate all boaters using the areas. In order for a body of water to become designated as a No Discharge Zone, there should be one (1) pumpout station available for every 200 to 300 slips. Once this number is established and the pumpout station is operational, the body of water may be designated a no discharge zone by the EPA and the NJDEP. Current law for the also makes it illegal to dump untreated boat sewage within three (3) miles of any shoreline. Fines for illegal dumping may reach $2,000 or more. 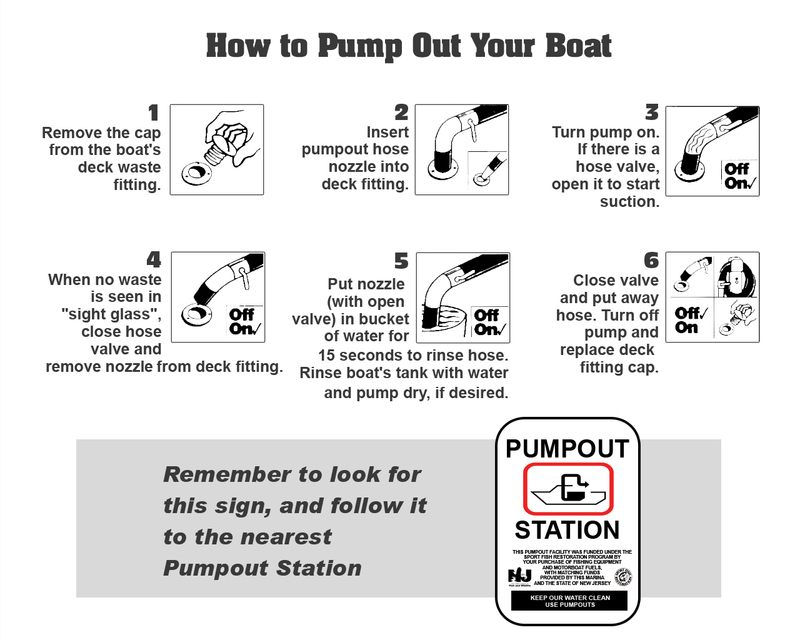 For additional information on pumpout stations near you, call the New Jersey Division of Fish and Wildlife at 856-785-2711 or visit the list of pumpout facilities available on this site.